A government minister has said he wants the death of a Nottingham man, killed by his schizophrenic grandson, to lead to improvements in mental health care. 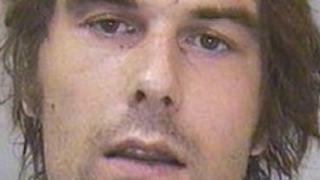 William Barnard, 30, stabbed his grandfather John McGrath to death in July 2009. It happened after he was allowed to stop taking his medication. Health Minister Paul Burstow said better health services were the only consolation that could come out of the killing. Barnard's grandmother Mable McGrath was also attacked and seriously hurt in the attack at the couple's home at Thorpe Close in Stapleford. Broxtowe MP Anna Soubry raised the case during a debate in Parliament on Thursday evening. Mr Burstow said: "Our priority now is to ensure that the NHS learns from the incident, at a local and also, where appropriate, at a national level. "I have asked my officials to look carefully at the issues raised by the case as they consider the future direction of mental health policy." Barnard's family now wants an independent inquiry into his care. Their solicitor Paul Bacon said the family met the minister after the debate and presented him with a dossier of recent similar cases. Mr Bacon said: "They were told they would be informed of what steps, if any, the department would take." Nottinghamshire Healthcare NHS Trust carried out an internal inquiry into Barnard's care and has said it was deeply sorry for its failings. A report commissioned by the trust into the case said there was "a disregard as to the significance of risk factors relating to Patient 09's [William Barnard's] deteriorating condition" and that his care "fell below acceptable standards". Barnard, who inflicted 56 wounds on Mr McGrath, was committed to Rampton high security hospital indefinitely in June. He admitted manslaughter on the grounds of diminished responsibility and pleaded guilty to a charge of wounding Mrs McGrath with intent.